We all know the importance of growing our email list and getting more leads. Lead generation is essential, after all, to not only grow but also avoid stagnation or regression in your business. If you aren’t getting any new clients, after all, you can’t even maintain stability when normal churn rates kick in over time. Lead magnets can help with this. There are a handful of different types of lead magnets that you can use to both build relationships with potential clients and get their contact information at the same time, helping you to sign more qualified clients faster than ever. Not all lead magnets are created equal, however. 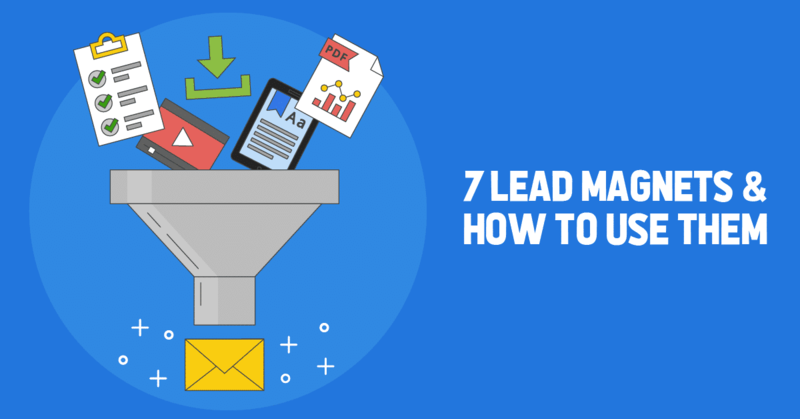 Let’s take a look at the 7 most effective types of lead magnets and how to get the most out of them. Ebooks are one of the most popular types of lead magnets out there, and they typically range from two pages to around twenty pages long. For best results, they should be well-designed and contain plenty of images or design elements like graphics or charts. You can mention your product or service in the ebook, but it’s best to focus instead on giving the customer the information what they want. You can include a quick sell at the end or subtle mentions throughout. They’re a standard offering, so you aren’t going to have people wondering what you’re trying to pull. They’re often evergreen, meaning your audience will get more value out of it longer, and you’ll be able to offer it as a lead magnet for longer without having to update it. Ebooks often contain in-depth, actionable information that’s valuable to the user, and therefore is a great incentive for them download. 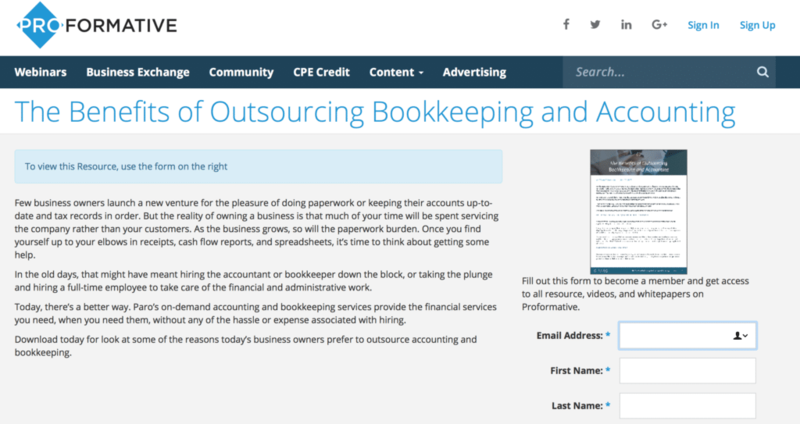 Formatting them and writing them can be time intensive, require skill, and be expensive if you outsource. There’s a lot of other free ebooks out there, so you need to make it clear why users should download yours. Case studies focus on experiments, using research to uncover how specific tactics, products, or strategies work to accomplish a goal. Theys can range from “our product eliminated 90% of zits in 40% of patients” to “using 11 hashtags gets you 15% more results on Instagram.” They can be shorter, and because you’re compiling unique information, they’ll be valuable because no one else can provide this information. 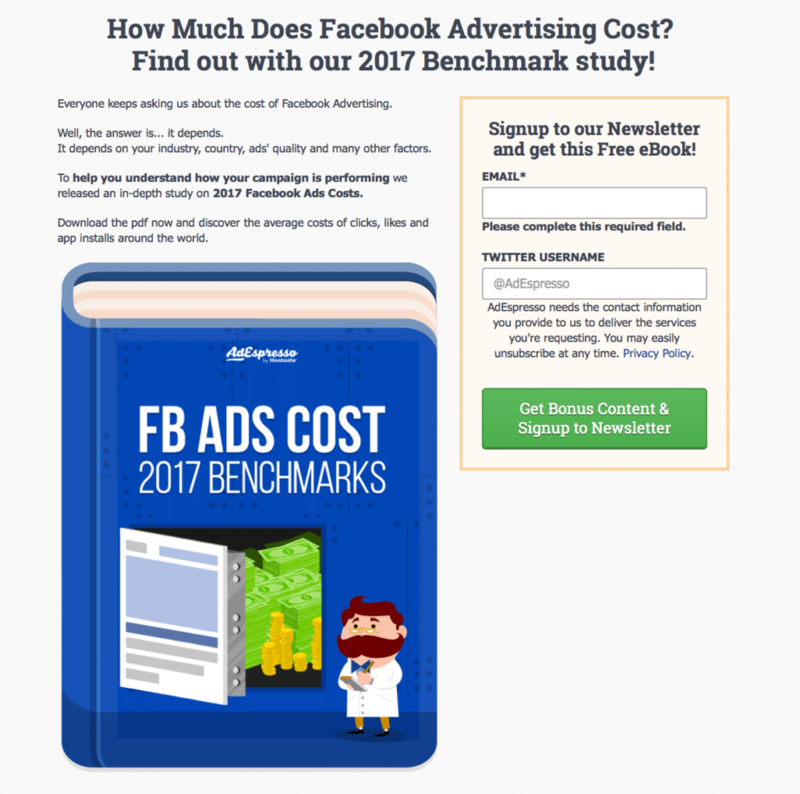 AdEspresso’s Facebook Ads Costs Benchmarks ebooks actually fall into this category, providing data pulled directly from AdEspresso’s software. No one else could provide these specific numbers, making the case study valuable. Case studies are inherently unique; the research and data is yours, so it would be hard to replicate. Case studies are most effective when they include hard statistics, not just generalized statements of what happened. White papers are heavy in the research, and they’re often comparatively very formal than a lot of the other lead magnets here. They’re essential in-depth reports that are both authoritative and persuasive, but that of course doesn’t mean that they need to be boring. These are a great way to establish your authority in a subject. They allow you to provide something of value to peers in addition to your audience, which can mean more shares. Whitepapers can be evergreen (or relatively so), getting you more results for longer. White papers, like ebooks, need to be well-written and formatted correctly; this can be time consuming and expensive. It can be difficult to create white papers that your audience will want to read. This strategy typically works better for B2B busiensses or those that are science-based than B2C businesses. For best results with white papers as lead magnets, create content that your audience will want to read. Ask yourself how the content will be relevant to them, and you’ll be good to go. Checklists are often a page or two long, and are inherently actionable for your target audience. Examples may include “10 steps to take before you run your ad campaign” or “The 5 things you should keep in your purse to tackle any disaster.” Checklists should be formatted beautifully, but there are some great tools like Snappa that can help with this type of simple design. They’re easy to both write and great; both steps here take very little time. They’re useful, so audiences are more likely to download them. It’s easy to promote them at the end of blog posts and get clicks and downloads. Some other lead magnet options can do more to help you build relationships and establish expertise in your field. Infographics are versatile, and you can share them on your blog or offer them as a lead magnet. 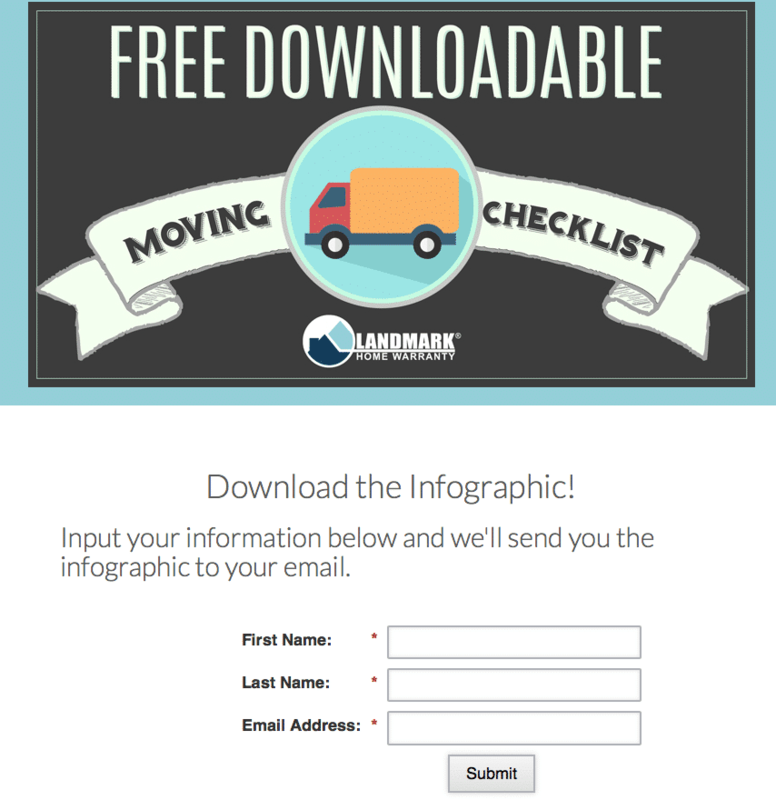 Some businesses will feature them on their site but then offer the downloadable/printable version as a lead magnet, which can work if it’s actionable (think checklists or resources you’ll use regularly). They can be evergreen, giving them a longer lifespan. People love visual content, so it will be easy to promote on multiple channels. They can take a long time to make, and they won’t get as many email sign-ups as other options here. It can cost a lot to hire a designer to make an infographic if you want something that graphics software can’t help with. 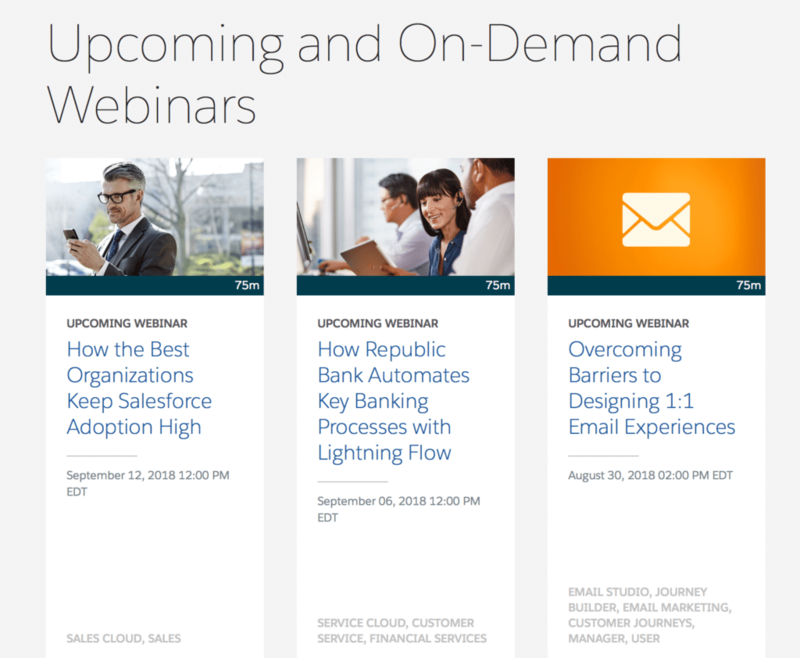 Webinars allow you to build relationships with customers, and they offer a lot of value. Being able to watch a presentation from an expert in real time and even potentially ask them questions is huge, and it typically builds rapport. You can even have other experts come onto your webinar for more exposure, and just require that users sign-up with their email address and name in order to be able to participate. Make sure that your webinar is more useful than it is promotional. No one likes getting on a webinar to learn, only to be sold to for an hour. You can interact directly with your audience and answer questions live, showcasing your authority. Once the webinar is over, you can save the recording and then use it as a lead magnet, or share it on social media for brand awareness. They can take a lot of time to create, set up, and promote. You need to promote them heavily in advance. There is the risk of technical issues at every turn, and you don’t know what will happen live. Webinar software can get expensive, depending on what you need and which platform you choose. Free consultations may not seem like a lead magnet, but if you go about it the right way it can be. It’s important to note that consultations can be tricky. You can easily end up on the phone with someone who has zero intentions of hiring you, or maybe is about 10% invested, and really just wants the free advice. To prevent this from happening, put a time limit on calls, and explain what you’ll discuss up front. You don’t have to do specific strategies or map out your master plan for clients, but instead can discuss examples of what might work. It typically doesn’t cost anything to offer free consultations via phone or Skype. This allows you to build a one-on-one relationship with clients. It can be difficult to keep calls on topic and not give away free work. Sometimes your time is wasted anyway. This is not evergreen, and requires constant ongoing work to attract the lead. Unfortunately, your work isn’t over once you actually create the lead magnet. You’ll still need to promote so that potential leads can find it in the first place. Have a dedicated landing page just for the lead magnet. You’ll notice that almost all of the lead magnets had a landing page whose sole job was to get users to sign-up for or download whatever the magnet was. This is important. You can optimize this page for SEO, getting some traction from searches, and it also makes that lead magnet the only thing users are looking at on the page. There’s no distractions, and you have something easy to link back to. Run ads. Just because lead magnets are a type of inbound marketing doesn’t mean that you can’t use outbound strategies to amplify it. Promote your lead magnet on Facebook Ads, ideally using lead gen ads for best results. You can read more about different options for how to do this here. Alert your email list. I know this doesn’t seem to make sense at first, because you already have these users’ email addresses; why do you care if they take advantage of your new lead magnet? There are a few reasons. They may like it and share it on social media, introducing you to a new pool of relevant leads. There’s also the chance that it will remind them to purchase from you again. Or, sometimes, they may still be trapped as a lead, and getting another lead magnet could be what gets them to convert. Create a content funnel. Content marketing is a great way to bring traffic to your site and establish expertise, but it’s not enough to just write blog posts forever. Instead, write posts that are relevant to the lead magnet, and promote the lead magnet within them. Place a CTA at the end of the post to check it out and download it. All of these lead magnets will help you attract new potential clients and start to build a relationship with them. You can prove that you know your stuff in the process, and as an added bonus, most of them even have the potential to be made so that they’re evergreen, making that single lead magnet even more valuable. Like all other areas of marketing, it’s good to use different types of lead magnets. This will help you see which offers and resources most appeal to your audience, but having different lead magnets will also help you reach more people, period. Having multiple touch points online to onboard new leads will help you in the long run, especially if at least a few of them are evergreen. What do you think? Which lead magnets have worked best for your business? How do you promote them? Which are you most likely to respond to as a potential client? Let us know in the comments section below! Awesome write-up Massimo! 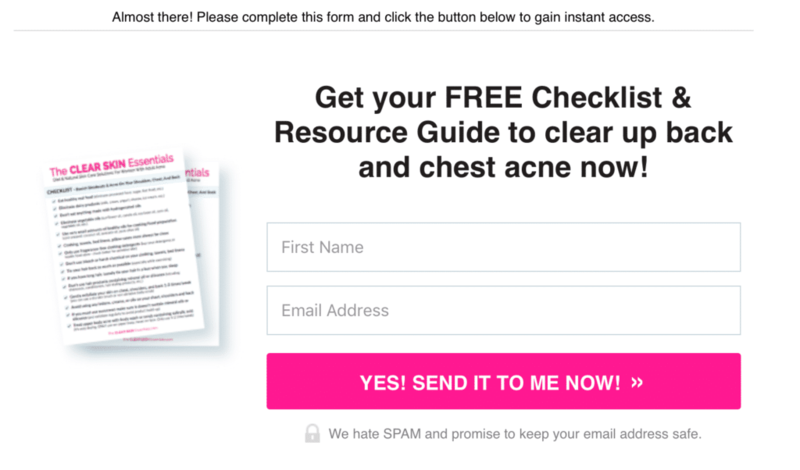 I’ve experimented with checklists before for getting email sign-ups. Reading your article has made me think it might be worth investing the time to create an in-depth case-study now. Cheers.